A Google search for ITIL and Cloud generates over 5.2 million results. 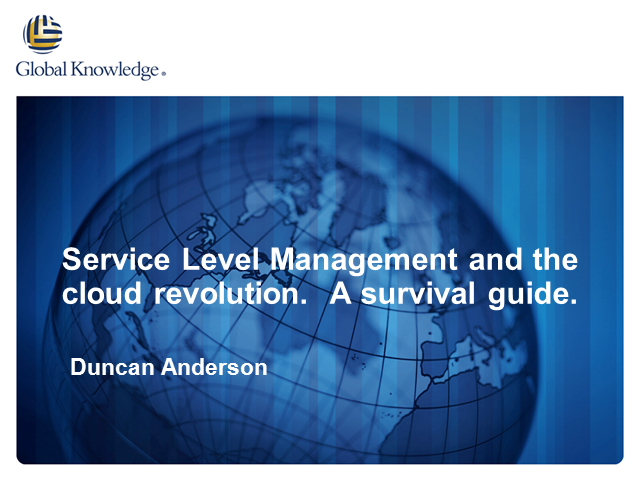 Rather than targeting the whole of ITIL this session focuses on Service Level Management and how the cloud impacts SLM. The session includes tips based around each stage of Service Level Management. Stages which receive more focus are Agree, Monitor and Improve. Duncan first encountered ITIL whilst managing branch technology for an insurance company in the 1990s. He joined the training industry in 1998 and has undertaken a number of roles and delivered courses in numerous sectors and countries. At the beginning of 2009 he joined Global Knowledge to deliver training on all of the ITIL curriculum on both public courses and single company programmes.